RBC has launched a new acquisition offer the RBC British Airways Visa Infinite Card. This time the offer differs slightly from past 50K offers in that there is a lower spend requirement ($5,000 instead of $9,000) however in lieu of having to spend as much you have to hold onto the card longer as the final part of the 50K bonus is awarded on your card anniversary. 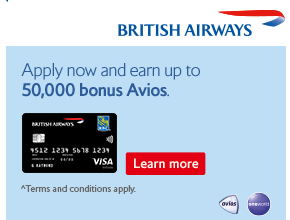 The sign up bonus remains the same at 15,000 Avios however 35,000 additional Avios will be awarded to any new cardholder who applies by Oct 31, 16 and spends $9,000 within the first 3 months of card membership. That's right $9,000! Remember back in 2012 when it used to be $5,000 for that extra 35,000? What can you get for 50,000 Avios? Just one example is 6 one way or 3 round trip short haul trips between Canada & North America in Economy Class(+taxes/fees). See how to do so here.